which one will fall into the lead? The gate opens and they’re off! with Dissappointment a nose back. While Joy brings up the rear. rise in and behind the pack. but not on the outside. dilate my senses and sensibilities. a word of brightness spoke. splaying the anticipation of ambush. with room enough for the I Am. into the corner of where I was. Hey, I found that “Hope” chapter, because I found my beat up copy of Mere Christianity while cleaning my disaster of an office. C. S. Lewis, Mere Christianity on Hope. Desire, emotions, and feeling things have been suspect of late. I doubt my feelings and pin my desires behind my back as it were, wondering if they will betray me. I put hope in that category too. Hope isn’t an emotion, but it can keep emotions somewhat awake, don’t you think? This world, in some respects, is a mirage…emotions too, are like steam rising off the pavement after a brief hot summer day. Our culture seems to be mood dependent. Well, if I really soak myself in the cultural abyss, (oh, so dramatic!) it’s more like the Moody Blues. I guess that’s when faith, HOPE, and love enter, and move us beyond mood dependency. Looking for Hope? Twelve minute writing. Twelve minute run of the brain. I can’t find my copy of Mere Christianity. I wanted to read the chapter on hope. I have no hope of finding it in the next few minutes. Often my hope is off somewhere sulking. Sometimes it is playing hide and seek. There are times when it is translucent as if I can see right through it to the hopeless state of things. An Eeyore moment has me saying short whining sentences, or answering a “How are you?” greeting with an answer like an essay question on a High School history exam. So, now I have five minutes left to write about hope. What I do know is everyone lives a thicker life with hope in the wings. Hope cheers us on to the next thing. Hope leads. Hope gently takes our hand. Hope see the possibilities. I’m not a natural “hoper.” So when things get rough, or complicated, or senseless, I first sit in the mud, as it were, pointing at all the fractures. My time is up. It’s 9:00 a.m. I found hope, it was in my breast pocket. How is your relationship with hope these days? Could this be the end of reason? Is the gun mightier than the sword? and holes through the body? Where are the talking heads taking us? as fast as we can with lukewarm milk. and exorcise our rights against humanity. Lord God Almighty, revive hope. with their bellies distended and all. on the whole lot of them. hold fast to a fast. May they retreat from treats. May their locus lose its control. desist as I turn to You. Why Two Days Changed My Fussbudgetness. Lucy, from the comic strip Peanuts, was often referred to as a fussbudget. Over the past few years I have become a fussbudget, my heart traipsing around the landscape of complaint, unbelief, and fear. Recently I described it to someone as brooding. I can’t seem to nail down a solid description of my state of mind. Needless to say, my silent grump grump aint helpful to those in my proximity. The next day my longboarding (i.e. big skateboard for riding hills, not do stunts) daughter took two of her brothers to surf a local neighborhood. She was merely 3 to 4 inches off the ground and fell to earth with a thud. She dropped and rolled, but in the dropping she sustained quite a blow to the basil part of her skull. 911 was dialed, and an hour or so later she was in a medically induced coma for a closed head injury. She had a basil fracture, broken cheek bone, but no other broken bones. There was hardly a scratch on her otherwise. Barbara and I were beside ourselves with concern as the first twenty four to thirty six hours were a roller coaster of emotions and worry as the doctors came and left with assessments. I said short prayers to God. Not today. No funeral today God. Help! Other people said the longer prayers. Lots of people said the longer prayers. Our entire family is grateful for the longer prayers, and all sorts of other support through this reality. Today our daughter is in a state of the art rehab facility called Mary Free Bed in Grand Rapids Michigan. Today she is. Today she is the same captivating daughter after her chute didn’t open on that hill. Today she is a self-proclaimed “safety nerd” as she deeply regrets not wearing a helmet. She is not finished healing, but is coming along much faster than predicted. That is the reason I am writing about these two days. This is why I confess to the world and God my own fractures. Just because we are human, we flake out sometimes. Come on, admit it. God went looking for Adam and Eve in their nakedness. Why would God not look for us? I know this opens up the Pandora’s Box of why many things don’t make sense, all the way from 9/11 to a weak baby chick not surviving. I, for one, need to hop off my little private, arrogant self, and admit I have a lot less control than I thought. Today, I thank God for those who continue to hold us through prayer, presence, and embraces. Life is mysterious. God is mysterious. So, if you find yourself in a fussbudget frame of mind, that’s okay, no judgement here, but consider the possibility of coming out from hiding. God is looking for you, along with some human humans. God, thank you for all the loving people in my life. You show up when they show up, whether I admit it or not. Lord Jesus, Son of God, have mercy on me a sinner. Amen. and blow her yellow kisses. Lay them golden on her olive skin. 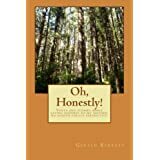 Gerald the writer"s book Oh, Honestly! © Gerald Allen Barrett and parentheticallyspeakingin3d, 2012. Unauthorized use and/or duplication of this material without express and written permission from this blog’s author and/or owner is strictly prohibited. Excerpts and links may be used, provided that full and clear credit is given to Gerald Allen Barrett, parentheticallyspeakingin3d, and geraldthewriter with appropriate and specific direction to the original content.